We’re about to put a vegetable into some bourbon so I’m pretty sure all is right in the world. Butternut squash infused bourbon, you say? YES I DO. Let’s get in to it and make the next eight-ish weeks of holiday fun perfect. Guys, I am reeeeallllly heavily riding the early holiday train this year. I don’t know what it is! Some years, I’m all aboard on November 1. Other years, I wait until after Thanksgiving. I don’t think I’ll decorate or put up a tree until after Thanksgiving, but right now all I want to do is blast Christmas music like a crazy person. And stalk the Target holiday section like a freak. 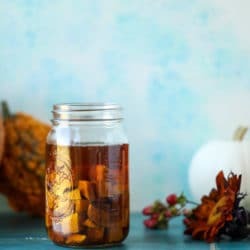 Last year I made a few different kinds of infused bourbons, but oh my, butternut squash was NOT one of them! I didn’t even know that such an amazing flavor could exist in bourbon until I saw something about it a few months ago. That being said, these apple pie, vanilla chai and chocolate orange bourbon variations are all incredible if you think that putting squash in your bourbon is WEIRD. It’s okay. I get it. However hello, ROASTED cinnamon sugar butternut squash bourbon? I mean, sign me up! I’m telling you all about it now because this way you can infuse your bourbon before your friendsgiving meal, before your Thanksgiving meal or before the holidays or whatever. You can probably get away with infusing it for a few days, but give it a week or two and it tastes like heaven. Sort of pumpkin-y, but without all the spice! Just how I like it. So, there really isn’t much to this. All you have to do is roast the squash and pour some bourbon over top and let it sit. But! It’s what you do AFTER that really matters. Right? I made these butternut infused manhattans because THOSE just sounded to die for. I also love the idea of a butternut hot toddy or old fashioned or even a mint julep! Sooo many options here. It’s also a fun thing to gift (my cousin and I make this amaretto every single year to give people!) because it’s just different. And you don’t have to give a huuuuuge jar to anyone because it’s not like you need gallons of it, so small portions work great too. Can you just tell how obsessed I am? Please join me. Place the cubed squash on the baking sheet. Sprinkle with the sugar and the cinnamon. Roast for 25 to 30 minutes, until it's somewhat dried out but also tender. Remove the squash and let it cool. Place the squash in a large container or mason jar. Pour the bourbon over top and cover the jar. Let it sit and infuse for a week or two. When ready to use, drain the bourbon through a fine mesh strainer (maybe even once or twice and package or use! Fill a chilled glass with a ice. In a cocktail shaker, shake the bitters vermouth and butternut infused bourbon for 30 seconds. Pour over ice and add a cherries or two! Um maybe we can also make chocolate sauce. And cake! And caramel. Eeeep. Friendsgiving 2017! Maple Cream and Apple Baked Brie with the Ultimate Friendsgiving Crostini Bar. I’m going to make this for our Friendsgiving in 2 weeks! What a great idea! oh, that would have been good to include, right? HA!! sorry about that. yes yes, drain it after the week or two. oh man, i probably wouldn’t eat the squash. i have done this with pineapple before (soaked in vodka) and the pineapple is so potent that is actually burns the heck our of your mouth! Oh my these look so good! This may be a silly question, but do you let it infuse at room temp or in the fridge? p.s. after seeing you link that amaretto recipe a few years ago, I also make it & give it as gifts during the holidays now. It’s so good! Thanks for sharing! isn’t that amaretto the best?!? room temp is probably fine for a few days, but since it is produce, if i’m going longer than a week, i’ll stick it in the fridge! I would never had tried this but it sounds really interesting! Could I infuse the squash for a couple of hours and then make it a side dish?